IM BACK! And I have been busier than ever this week!!!! This is the finished sock monkey army and brown monkey for Mabel. I have made even more since and i will post the better ones when i can. Along with it is the finished scary long "Clifford the big red dog" monkey. 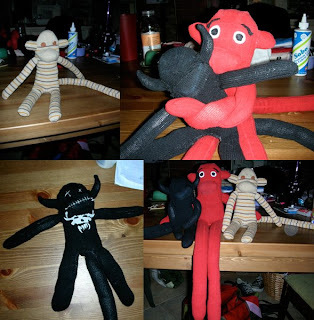 and I taught my roomie Andy how to make them and he made a Danzig monkey! hes so clever. It came out great!